there are a few lines above 700nm which I can strongly see too, but I can't find sources which clearly label them as the IR Hg spectrum isn't very important to most people/uses. Recently the High Pressure Mercury yard lamp my wife's family put up in the 1970s failed and I installed a Low Pressure Sodium lamp in its place. This worked excellently as LPS has a higher efficacy than hp-Hg and since color rendition is irrelevant in this application there is no downside to purely monochromatic light. 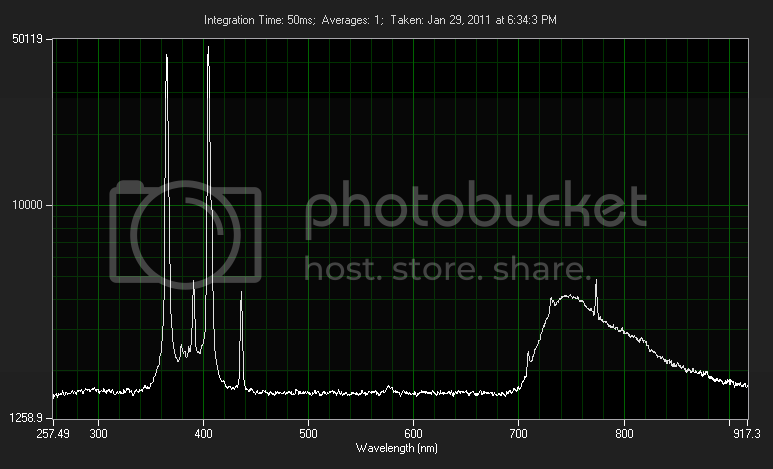 Well, messing around with an old mercury lamp rekindled my love for the Hg emission spectra. I got a great deal on a very inexpensive 100W all-in-one Hg lamp assembly and installed it over my work bench in my office. I've really been needing a lamp here as the room's lighting is behind me when I'm at my desk and I cast shadows over my work area. Now my camera makes it look a lot colder and bluish-green than it really is. In fact, it looks pure white to my eyes, with no detectable blue/green tint. It is also brighter than the camera lets on, as it tries to darken the image when pointed at the lamp. Though, as stated elsewhere I have an extended spectral response. I can see emission lines well beyond 700nm from this lamp, so to me it isn't missing nearly as much of the red spectrum. The lamp housing stops all lines below the 405nm Hg line from passing, but I can still detect some of the 365nm faintly when checking the spectra. If I remove the front cover I can see it much stronger. The outer envelope of the lamp severely attenuates anything below 350nm, but fluorescence identifies at least some minor 254nm/264nm/313nm components leaking through, even though they are too washed out for me to see even the 313nm line. Color rendition with this lamp is diminished, though I can clearly see the difference in colored items without any problem. Due to only a rather weak 611nm line emission red objects look a bit maroon or purple due to the lack of emission lines in their peak reflectance range. If you can't see the >700nm lines as well it looks even darker. Plenty good for my intended application though. Upon further investigation I determined the mode of failure on the old 175W Hg yard lamp (which was dimmer than the new 55W LPS, and less effective) and was able to repair the ballast and get the old bird working again. I had destroyed the old bulb as it was definitely EOL at nearly 40years of service. I hadn't tested out the new bulb my mother in law grabbed from the hardware store yet though, as obviously I had no way to power it with the ballast broken. To my surprise it turned out to be a diamond in the rough; this is a color corrected 175W Hg lamp! She paid only $15 from the local hardware store that had it sitting on the shelf since "before the clerk started working there in the 90's". These lamps forfeit some of the 405nm and 435nm emission of normal bulbs for enhanced >610nm emission which "warms up" the color and provides greatly enhanced color rendition. There is a phosphor coating inside of the outer envelope instead of a diffusing white layer like normal, or clear like in the case of the 100W lamp above. The trade off is less lumens per watt. This 175W lamp only puts out 5000lm, where as the 100W clear envelope one puts out 4700lm. I'm going to have to build a wooden enclosure for this lamp ballast and find a suitable way of mounting it. I'm going to put this lamp to good use! Note the lack of bluish-green tinge - same camera in use. 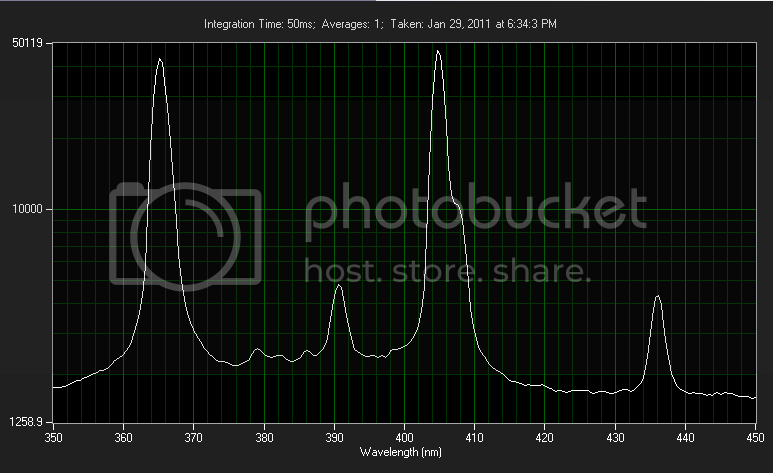 Observing the spectra from this lamp shows a greatly reduced 435nm line and a greatly enhanced 610nm line. Yep, that'll warm things up! Also of note, I can't detect any <405nm from this bulb. These two lamps when used together are close to ideal lighting for my work room. I like "colder" lightscapes with high luminosity. I can't stand "warm glow" fluorescents or low wattage incandescents. Also, the "high" emission of UVA and NUV from these lamps stimulate vitamin D production without the sunburn hazards present when using low pressure Hg lamps ("sun lamps") or going out in the sun. Growing up I though all light bulbs worked the same. I'm only beginning to see the tip of light emitting sources. These are so cool! Much like the LPS and HPS lamps these are fun to watch start up too. It ignites with a flash of purplish-pink with green sparks as the mercury is sputtered across the inside of the arc tube. Then a bluish-purple Argon glow takes over and you can slowly see the Hg frosting vaporize from the electrodes inward. As this happens and the pressure rises the glow discharge tightens and finally pinches into a tight power arc as the other emission lines come to power. I still need to get a high pressure Sodium lamp, Sulfur lamp (these are powered by microwaves!!!! ), and a xenon short arc lamp one day. Currently using a multimode HeNe as a lamp for the spare bedroom. What out there has a soft, not too bright, soft glow? Wouldn't mind getting something outside of the traditional light bulb we are all used too. I like to be different. Low power <40W HPS lamps are pretty soft. If you can find one (plus a matching ballast!) around 15W or so that will work well. Ebay here I come! Thanks! Nice! Although not sure I'd like being that close to a high pressure lamp - I've had a bad experience before with a ~400W blacklight bulb exploding, showering me with hot glass. The inner tube was still intact and going, god knows how much UV I was looking into before it got shut off. Ouch! Yeah you have to be careful to not shock the envelope on these. I was originally planning on using my CO2 laser to cut off the envelope and make a UV curing box out of this 175W lamp before I noticed it was a rare color corrected bulb! High pressure Hg lamps will run without issue with the envelope removed and it makes a super intense UV source, some can even put out the 185nm that ionizes the air! I may grab a regular 175W Hg bulb and make that UV source anyway. I always thought the outer bulbs were under a bit of pressure to reduce pressure on the internal envelope? It went off with a hell of a pop anyway. They're usually filled with a hard vacuum to insulate the quartz arc tube to improve efficiency. Though I have seen some bulbs with a N2 fill. Now THAT is an understatement. CRI is around 17. Even high pressure sodium is higher. Try taking a picture of someone's face under this light. They will look like a corpse. They're even cheaper on ebay if anyone else wants one. The DX (deluxe) in the title/model is the identifier for a phosphor coated bulb. I like "colder" lightscapes with high luminosity. 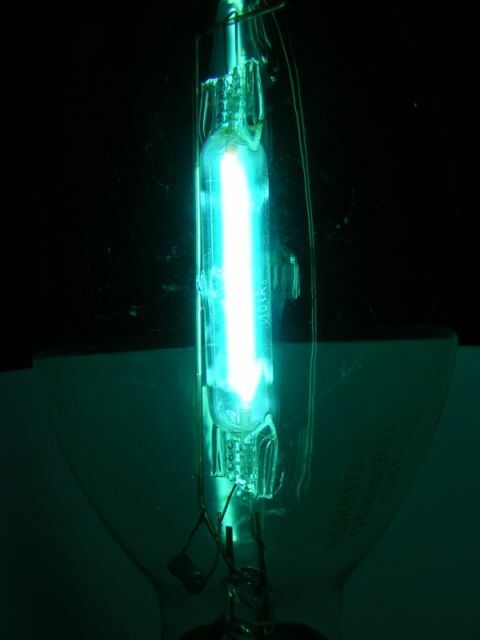 You should look into metal halide. At least twice the efficiency, and a much higher CRI than even the DX lamps. The ballasts between these two lamp types are somewhat compatible as well. Your 175W mercury ballast will run a 175W halide lamp. They're also available with bizarre metal salts like thallium or indium which give the light a green or blue tint respectively. You're not gonna find one under 35W unless it's a strange collector's item. Even at a measly 35W, they'll output >2000 lumens so it's comparable to 150W of incandescent. 35W HPS lamps are cheap and easy to find. The 35W ballasts? Not so much. If you're looking for a "soft glow," stay away from arc lamps. Very nice , makes me wana run my 2 400 Watt black light bulbs xD , I do have 4 250 watt ballasts and ignitors , may try and get some coloured metal halid bulbs for them . I saw some 18W HPS bulbs a year or so ago, almost bought em too. You can run them on the Fulham Workhorse electronic fluoro ballasts. Those ballasts will run any HID except pulse start metal halides. 50W ballasted HPS fixtures are common it seems, but too bright to be considered soft. I found a nice indium electrode-start metal halide for my wall fixture, thanks Cyparagon! Ill de-envelope the Hg bulb in there when I get the MH replacement. At 4200K and 65CRI it will be an awesome upgrade that is still cool enough of spectrum for me. Much like the LPS and HPS lamps these are fun to watch start up too. The strangest lamp I've seen for startup behavior so far is a HPS-halide retrofit. It's got an additional neon fill to lower the starting voltage. Then the mercury vaporizes to change the tube to a white. Then the sodium vaporizes to change the tube to yellow. As the pressure increases, the line broadens to the standard white/yellow/pink. Those have an interesting spectrum. Since everything is so hot inside, there's a lot of NIR emission. And woods glass passes NIR. Closeup of standard 175W mercury arc tube, for those interested. As stated before, these are white, but often appear blue/green on camera. Holy crap those are astoundingly beautiful! Do you think you could find an example of one for sale somewhere? I don't even know what to search for to find it. The drop in replacement MH I grabbed is a European tri-salt one, which are easy to find. 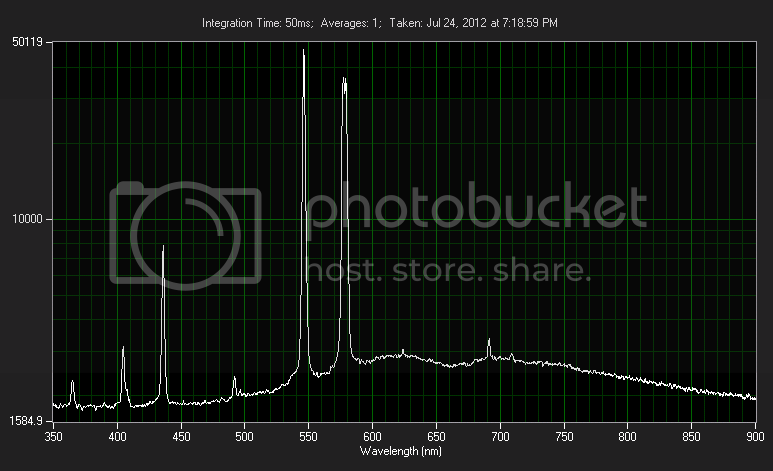 Very nice to see the spectrograph on a woods lamp that isn't cropped at 500nm (or 700)! I had a 300W spotlight version when I was a kid that was surplus from industrial leak detection. It always looked red in output for me and I first thought it was an IR lamp instead of a UVA lamp! It wasn't until I realized it was causing fluorescence that I figured it out. 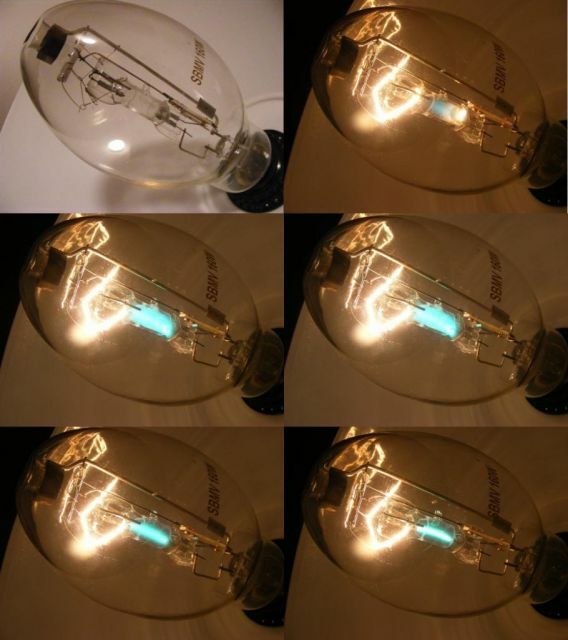 Somewhat related; I used to have a ca.1940s 500W low pressure mercury lamp with exposed quartz discharge tube. That thing was awesome. It would fill a room with enough ozone to choke you out in minutes. I remember bleaching a towel by hanging the towel in front of it and leaving it on for an hour or so. Got my first case of arc eye! Sadly I think my family junked it in the trash when I moved out. Wish I could get my hands on it again.